AC Repair Kernersville NC | Cool Breeze 1250 Heating & Cooling, Inc.
Keep your home warm and cozy through Winter's chill. Get a tune-up on your existing furnace or heat pump to ensure it works efficiently when the cold days sneak in. or find out if installing a new unit is the best option for you. Make sure you keep your family cool and comfortable through the scorching Summer heat. Install a new energy-efficient air conditioner right away to ensure your AC unit is running efficiently through the hottest days. We offer you peace of mind, ensuring your equipment operates safely. We help you save money on your fuel bills. And, we help deliver relief to those with allergies and many others concerned with the quality of the air they breathe. By doing what it takes to ensure each customer's complete satisfaction, we are welcome in more homes in the Kernersville, NC area than any other contractor. As a Certified Comfort Expert, we can install or repair any major equipment brand. Our staff works diligently to meet or exceed your expectations. You are sure to appreciate our detailed results and our devotion to customer service and support. See What your neighbors are saying about their experience with us! Get an annual tune-up on your HVAC system and save energy and money on your utility bills. See how an annual maintenance plan can benefit you. Are you tired of having uncomfortable rooms that are either 'too hot' or 'too cold'? Efficiently zone your home to give you a more even air flow. 20% of of air in most homes is lost through leaks in the ductwork, resulting in higher utility bills and uneven temperatures. Our trucks are fully stocked and our techs are equipped with all of the tools and a large amount of equipment needed to do most jobs. 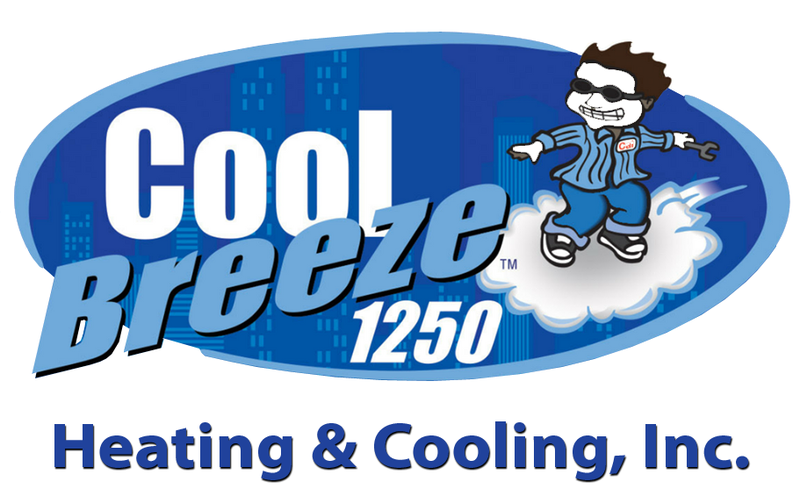 Cool Breeze 1250 Heating & Cooling, Inc., is a North Carolina (NC) Heating, Cooling, Air Conditioning, Heat Pump, Ductless Mini-Split, and Furnace repair, service, replacement, and maintenance Company located in the Kernersville Area. Cool Breeze 1250 Heating & Cooling, Inc. employs only the best technicians for air conditioner repair, furnace repair, and heat pump repair as well as all air conditioner replacement, furnace replacement, and ductless ac replacement. We offer emergency repair service in Kernersville NC, Colfax NC, Oak Ridge NC, Walkertown NC, Winston Salem NC, Belews Creek NC, Greensboro NC, High Point NC, Wallburg NC, Jamestown NC, Stokesdale NC, Summerfield NC, Rural Hall NC, Germanton NC, Walnut Cove NC, Bethania NC, Pine Hall NC, Thomasville NC, Pfafftown NC, and Welcome NC. So when you ask to find "A good heating and air conditioning repair or service company near me", you've come to the right place. To set-up a repair service estimate or replacement estimate, call 336.497.1250. Cool Breeze 1250 Heating & Cooling, Inc. services all furnace, AC, heat pump, humidifier, filter, thermostat, and ductless air conditioning brands including Carrier, Bryant, Payne, Trane, Lennox, Rheem, Ruud, Amana, Daikin, Mitsubishi, Fujitsu, Gibson, Goodman, American Standard, General, Aprilaire, Honeywell, White Rodgers, Dynamic and Skuttle.